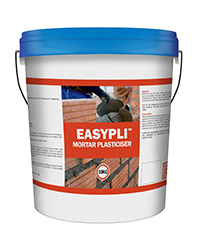 CEMIX EASYPLI powder has been formulated especially for the bricklayer and block layer who is looking for a high yield, low cost, plasticiser using a combination of non-toxic, non-staining chemical powders. CEMIX EASYPLI will meet the needs of the tradesman by giving good extension to board life, excellent workability, good hold on the trowel and reduces water content. CEMIX EASYPLI meets the requirements of NZSS and ASTM when used in accordance with directions for dosage and mixing. CEMIX EASYPLI can be used for all Portland cement/sand mortars for bricklaying, block laying and plastering. The addition of lime and admixtures is not needed. This product can be used for coloured mortars including black oxide and white cement. Add CEMIX EASYPLI to 2/3 of water in mixer, add 1/2 sand then cement, add remaining sand and balance of water to required consistency. There is no need to over mix mortar, a maximum of 5 minutes should be sufficient. To hand mix add and mix CEMIX EASYPLI to a small amount of water, mix into dry sand/cement mixture, then add water to desired consistency. Use at a rate of 30gm / 10kg bag of Portland cement. Usage is dependant on the sand or cement type and condition. More or less can be used to suit but it is important to not overdose. Packaging – 250gm, 700gm, 1.2kg, 2.5kg and 10kg pail. A 10gm measure is provided in each container. Store in dry place and shake well before use.